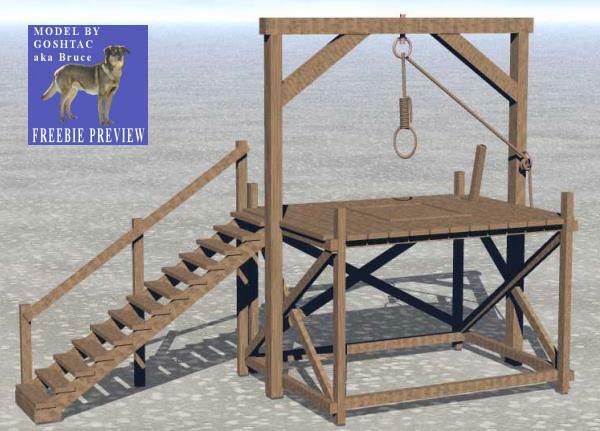 This model which was primarily made with Bryce 6.1 is of an Old West Gallows as might have been found in many bigger towns of that era. I have included several versions of this model in the zip file and have included some textures as well. There is a Bryce OBP Static Model, an OBJ Static Model and also a DAZ Studio scene file depending on your software of choice. The static models do not have any working parts and the trapdoor is shut on the gallows. Where as the DAZ Studio version has a null control for opening and closing the trap door and also the rope in the DAZ Version is in several parts and can be adjusted within DS for your rendering requirements. Note: DS version is just a scene file and not set up as a runtime content, so you may get an error message on missing textures when opening. Just look in the included map file for the textures. UPDATE 1-8-2009: I have learned that the DAZ Studio version may not work with some older versions of DS. The DS version of this model was created using DS 2.3.3.89 - Users of older versions may not be able to open this scene file. My apologies for this issue. But DS users can still use the static OBJ file included as a background prop in Old West renders. Please feel free to use for whatever projects you wish and feel free to share this model as a freebie to friends. See included text file for added details. Great work! Thanks for share! christy0 (6 years ago) Inappropriate? Onyx (9 years ago) Inappropriate? Great for an old west scene. Thanks! DarkkMaliciferus (10 years ago) Inappropriate? goshtac (10 years ago) Inappropriate? Thanks for the kind comments folks - Sorry about the issue with the DAZ version not being usable by some older versions of DAZ Studio. But those using older versions of DS should still be able to get use out of the static version OBJ file. There must me a new Sheriff in town.